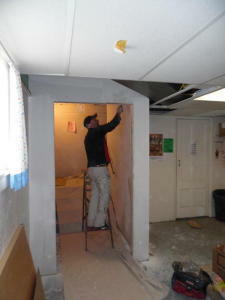 FCCGH starts the building improvements! 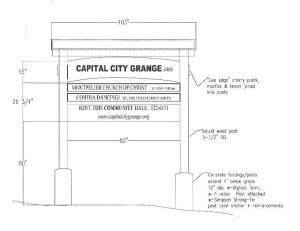 Beginning with the fire-exits, the Friends of the Capital City Grange Hall has begun the projects promised over the last year. The Friends have raised enough money (through donations, fundraisers and grants) to get going on the basement improvements which we’ve been planning for a couple of years. The bathroom renovations will start later, we’re hoping in the spring of 2015, after we raise enough money to complete that phase. The Friends have received a grant to cover 50% of the total cost of about $50,000, but we still need to complete raising money for the remaining half. 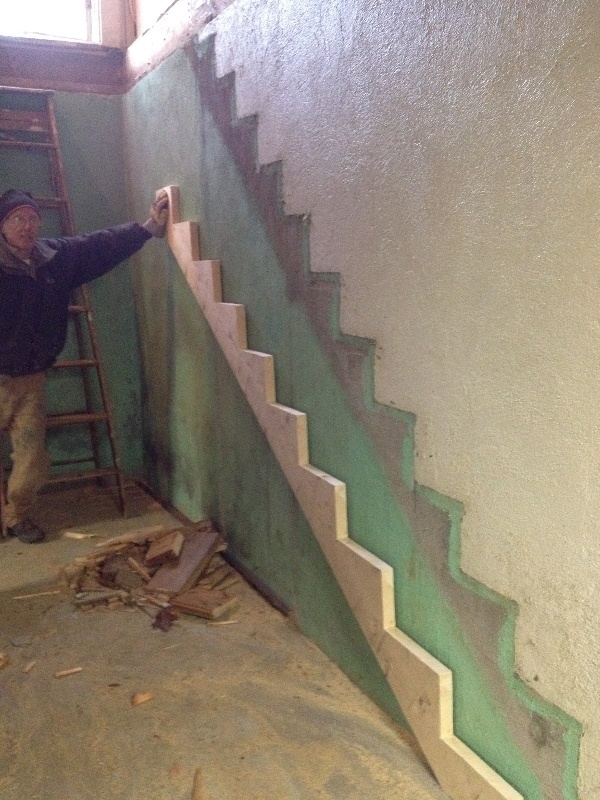 Right now, the existing stairs that led to the fire exit on the NW corner of the building have been removed, and contractor John Mallery is showing how the new stairs will run, using a new stair-stringer. 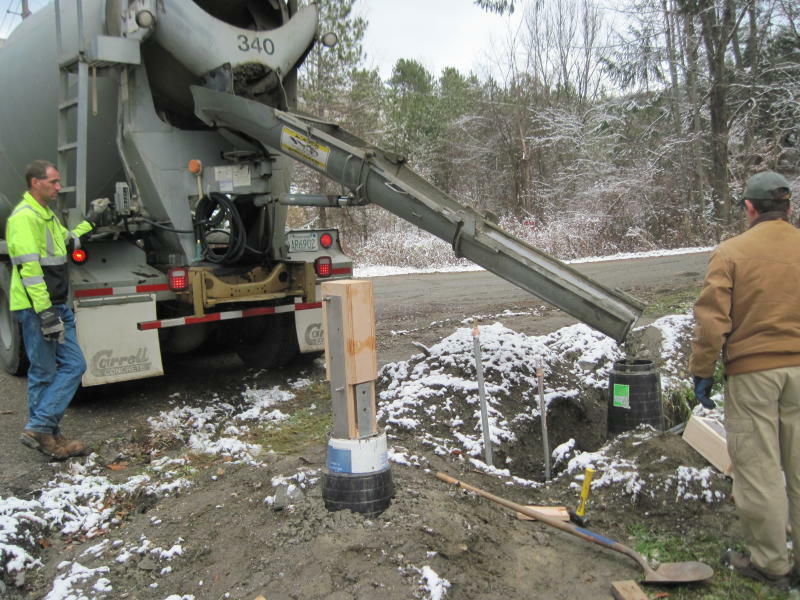 On Monday, a concrete-cutting company sliced through the foundation wall. Soon, the new stairs and a new landing inside will be framed in. A wall will divide the stairway from the upstairs Hall. New fire exit signs and emergency lights will show the way out, through a new exterior door, and there will be a new concrete landing on the outside. After that, John will build the new vestibule around the “front” basement stairs, with a fire-door and “fire-code” sheetrock-covered walls. All of these changes will make the Fire Marshal much happier with our downstairs space, and we will ask him to increase our legal occupancy for the downstairs from 49 (our current limit) to at least 100! Check out the changes next time you come to the Hall! 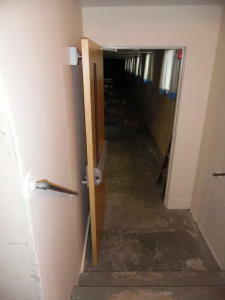 We’re making the Grange a safer place with our projects to improve the fire exits from the basement level. This re-construction of both exits, funded by the Friends of the Capital City Grange Hall, is in response to the requirements of the Fire Marshal. 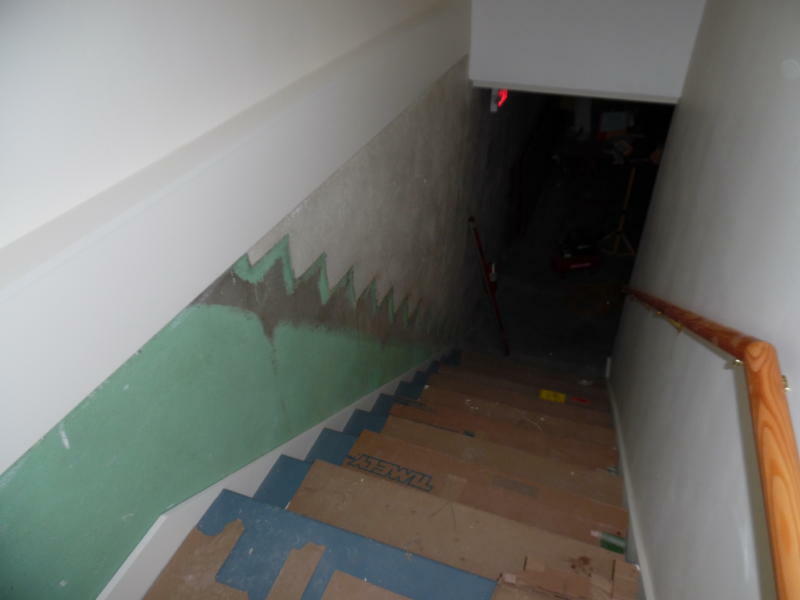 The new stairs and door on the NW corner of the building have been built by contractor John Mallery; he hired a concrete-cutting company to cut through the outside wall of the basement. John has also framed in the new vestibule at the South end of the basement, around the existing stairs. The new door has a magnetic hold-open, so it can be open for foot traffic, but will close automatically if the new smoke/fire detectors are triggered. The sheetrock and painting are done, and the new doors are installed. Electrical work has been roughed-in and must be completed before the Fire Marshal will sign off on the project–and increase our legal capacity in the basement from its current 49, up to at least 100, we expect! We are still fundraising and arranging financing for the 2nd phase of this project, rebuilding the bathrooms on the basement level. Keep in touch for updates on this part of the project too! And many thanks to the Legislature for funding the “Cultural Facilities” grant which will be paying for 1/2 of this project–once we raise the matching funds we need! The fire exit at the northwest corner has been completely re-built; the original stairs were too steep and too little headroom; we had to cut through the concrete wall of the basement to make the stairs come out at ground level. You can see the difference from the outline of the old stairs on the wall! The Fire Marshal required that we build a vestibule with 1-hour fire rated walls and a door, to separate the downstairs and upstairs levels. The new door in the vestibule can be held open with an electro-magnet. If we ever have a fire, the new smoke alarms on either side of the door will make the magnet release to separate the upstairs and downstairs spaces. The current project is the largest yet undertaken by the Friends. The $54,400 project will make fire egress improvements (emergency exits) to the Hall’s lower level where the building’s kitchen and dining area are located, and will significantly modernize the Hall’s main restroom facilities. Both of these outcomes will allow large cultural and community groups to fully utilize the Hall. Given the increasing popularity of the contra dances, the Hall’s managers invited a State Fire Marshal to inspect the building for fire safety. The Fire Marshal identified building egress improvements that once implemented will increase lower level occupancy from 49 to 100, and allow for concurrent use of both levels of the building. The current lower level occupancy limit of 49 constrains mid-sized and large groups from eating in the Hall’s dining area and has required Hall managers to restrict the lower level’s use, which is undesirable. Renovation of the building’s main restroom facility, also located on the lower level, will install an accessible restroom and replace stalls that are universally disliked as they are cramped and insufficient for the number of Hall users. – Carpentry, plumbing, concrete, and electrical work to demo existing and create one standalone ADA accessible toilet room and four unisex stalls plus hand-washing stations. – Carpentry and electrical work in stairway #1 to add a vestibule on lower level with fire door, per the Fire Marshal’s requirement. Plus plumbing work to relocate water pressure tank from this area to the furnace room. – Rebuilding stairway #2 to improve egress (currently the stairway is too steep per the Fire Marshal). This requires reconfiguration of the exit (concrete cutting and carpentry), the landing, and the stairway; and lighting and emergency exit signs. By May 2015, close our project financing gap through donations, fundraisers and grants to raise a total of $54,400 for the fire egress and bathroom modernization project. The Friends of the Capital City Grange hall, through fundraisers and generous community donations and grants, have raised a total of $42,750 (79%) of total project costs with a significant $25,265 contribution from the VT Art Council (made possible by the State of Vermont and the Vermont Cultural Facilities Coalition). The VT Arts Council grant requires dollar-for-dollar matching funds. Manage the rehab work in two stages. Fire egress work will be completed in the fall of 2014; bathroom modernization will be completed in the spring/early summer of 2015. A professional contractor was competitively selected to complete the work. A bridge loan is required to pay for improvements as the Arts Council Grant is only paid once all renovation work is finalized.